In March of 1970, pop singer Ray Stevens released his Grammy winning song “Everything Is Beautiful.” In March of 1972, novelist Chaim Potok published My Name is Asher Lev the refrain of which is “It’s not a pretty world.” 2017’s Martin Scorcese film Silence, (carefully based on the 1969 Japanese novel by Shusaku Endo), leans toward Potok while making room for Stevens. At 2 hours and 40 minutes Silence is hard to watch not because it is tedious, which it is not. It is hard to watch because it raises difficult questions of faith without offering easy answers to audiences uncomfortable with such questions. 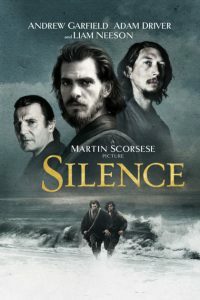 As did the book, the movie traces the lives of two 17th century Jesuit priests (Adam Driver and Andrew Garfield) who travel to Japan to find a priest and mentor (Liam Neeson) rumored to have denied the faith. From the ease of their Portugal, the report seems fantastical. They cannot imagine anything that could make their friend turn from his God. They are given permission to go to Japan and find him to prove these slanderous reports false. What they find is a once flourishing Christianity struggling to survive under systematic persecution aimed at its extermination. They are forced to watch the brutal torture of simple men and women of faith who hold onto their faith as they die. When reunited with the priest they sought, the reunion is not what had been anticipated. The questions raised are many. Had Christianity not been introduced to this island these people would not be dying. Are there some cultures in which Christianity is not meant to flourish? Is faith so certain that for it we must be willing to die? Would I be willing to do so? In the face of pain, is God silent? Or are we too deaf to hear him? Is there hope for those who are weak and unwilling and unable to die? How should we respond to the apostate? Is there hope for them? Where is beauty to be found? Is it never a pretty world? It’s a beautiful film about a painful world, a world that is beautiful and not pretty at the same time, a world in which, perhaps, God is not silent.